To Lucky’s family, she’s in the perfect marriage with her husband, Kris. What the family doesn't realize is just how convenient this marriage is-- a lesbian and her gay best friend married so he can remain in the country and so Lucky’s family will leave her alone about marriage. The tension in this Publishing Triangle Edmund White Award winning novel between Lucky and her family is something queer people everywhere are too familiar with, but the added racial tension that her family continues to build within their own community takes it to an entire new level. Now that Lucky must return home to be with her grandmother who just recently took a big tumble, it’s like she’s a teenager all again. 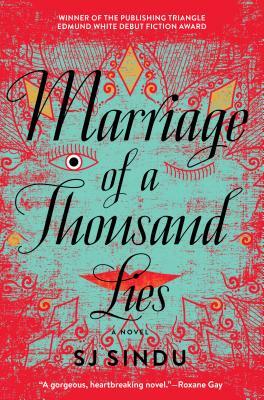 Marriage of a Thousand Lies will quite literally have you holding your breath. A necessary and exciting addition to both the Sri Lankan-American and LGBTQ canons, SJ Sindu's debut novel offers a moving and sharply rendered​ exploration of friendship, family, love, and loss.